Prestashop Top Sellers feature offers a great possibility of alleviating customers’ need to wander around your store looking for perfect items. 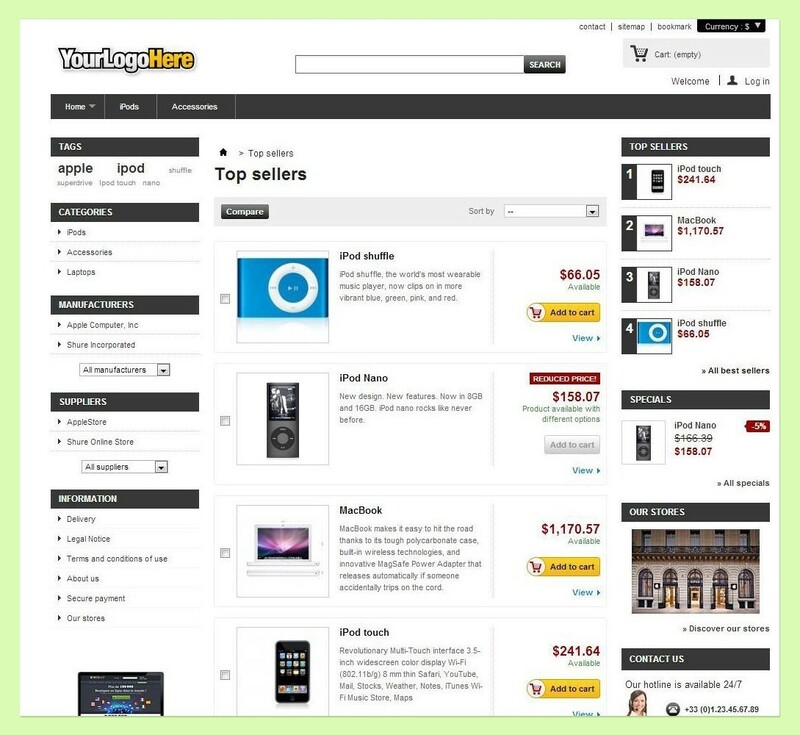 They all will be displayed in an automatically created list in the best sellers section as well as on the main page. How does Prestashop create this list and how the stats for the best sales can be viewed? Find the info in our article. /*There is an option in the admin panel which allows you to hide the 'Add to cart' button for those items, which have been modified. 'comparator_max_item' => Configuration::get('PS_COMPARATOR_MAX_ITEM') //the flag responsible for the maximum amount of items for comparison. $this->setTemplate(_PS_THEME_DIR_. 'best-sales.tpl'); //the template responsible for displaying the items. A special place in this controller is hold by the method ProductSale::getBestSales, which outputs the list of the most frequetly purchased items. It is worth noting that if you need to get the information about product sales rates it is better first to check the methods of this class. It is possible that the information you need can be obtained via the standard methods of the class PrоduсtSаle. I will only briefly list and describe these methods, as for their implementation you can see it in this file: classes/ProductSale.php. The content of the template shows that this is just a compilation of other templates, which we saw on the catalog page. Such an approach makes the markup of the page much easier: you just need to properly markup the Category template. Finally, I would like to mention the possibility of viewing statistics for the best sales. All you need is to activate the standard Best Selling Products module from the Analytics and Stats section. Great post Alex. Do you know how to modify the number of best sellers showing up. Ie, from 5 items to 10 items in the sidebar. Thanks in advance! They are shown when there are orders with invoices for those products. You need to check the class ProductSale to better understand this process. Presta by default gets all the products that have minimum 1 sale. How we can just get the first 10 or 20 products with the best sales ? You need to change the parameter that is transmitted in MYSQL: LIMIT. Unfortunately, I cannot say now where exactly you should do this, because I do not quite understand what block you refer to. So, please, provide more details. Александр, очень долго искал подобную статью. Если возможно, подскажите, как можно было бы добавить ярлык “Топ продаж” на странице товара на его картинке. Собственно говоря, интересует, как находясь на странице товара, можно определить, что он относится к “Топ продаж”? Please contact our support team at store@belvg.com as it is possible that the url has changed in the admin panel. how do i show best sale products in a month? bcz its showing old dated sales like fifa 15 game :D, best sales is not helping more for do advertisement. I know this is an old post but as Matt above I wonder how I can take best sellers for the last month? I have had a shop since 2014 and we had a great sell for one product during 2015, this product is still in top on our best seller list but we haven’t sold a single one of this product during 2018. This is a big problem for us, we want to show the best sellers during 2018 not the 2015 best sellers. An answer to this question will not fit into a comment. Please contact our support.